Srinagar: Kashmir remained cut off from the rest of the country for the second day on Thursday as the Srinagar-Jammu National Highway remaind closed and flight services were disrupted at the airport here due to heavy snowfall in the region. “Of the 31 flights scheduled to arrive at the Srinagar airport, so far, 18 have been cancelled due to poor visibility and heavy snowfall,” an official of the Airport Authority of India said. He said if there is no improvement in weather conditions, the arrival of the other flights at the Srinagar airport remains bleak. No flights were able to operate to and from Srinagar airport on Wednesday due to snowfall. 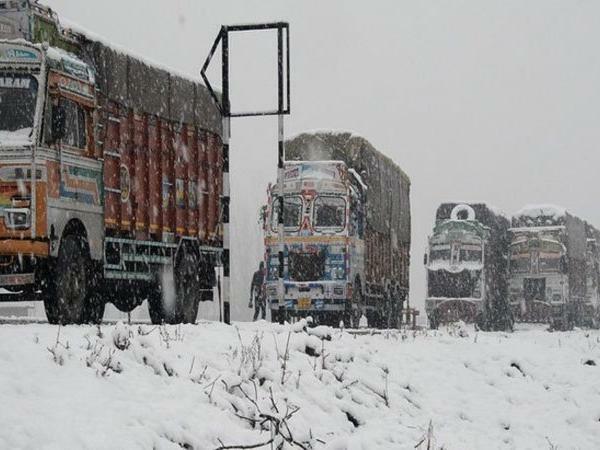 Traffic and police officials in Jammu and Srinagar said the Srinagar-Jammu National Highway remained closed for the second day due to accumulation of snow in the Jawahar Tunnel and Patnitop areas, and four fresh landslides in Ramban district. On Wednesday in Ramban district, at least 12 people were injured after their vehicle was hit by a boulder along the highway, the all-weather road linking Kashmir to the rest of India. There has been non-stop snowfall at the Jawhar Tunnel and Banihal areas. Fourteen to 16 inches of snow has accumulated, officials said. They said due to heavy rainfall in Ramban, incidents of landslides and shooting stones were reported from Marog, Battery Chashma, Anokhi fall and Panthal areas. “Traffic has been suspended on the highway due to piling of snow on either side of the tunnel and also landslides triggered by rains at several places,” a traffic department official said. The Border Roads Organisation is working to clear the highway of debris from the landslides and snow, the officials said, adding that inclement weather is hampering the clearance operations. Once the weather improves, efforts would be made to restore traffic on the highway, they said. On Tuesday, one-way traffic was allowed from Srinagar towards Jammu on the highway after five days of closure due to snowfall. The heavy snowfall has forced large number of people to stay indoors while traffic in the city and other towns of the valley was moving at a snail’s pace due to slippery roads.